REPLACEMENT BELT FOR John Deere GX20072, GY20570 (1/2×103). This a High Quality aftermarket replacement belt. To ensure you are ordering the correct belt for your machine. Please reference your OEM part number when selecting the belt for your machine. For riding mowers, the OEM sticker can usually be found under the hood or seat. Its always highly recommended to order based off of your OEM part number. If you do not have access to your OEM part number, please measure the outside circumference of your existing belt to make sure the dimensions match the belt you are ordering. ALL Lawn and garden belts are determined by their Outside circumference ONLY. Lawn and Garden belts are NOT determined by their diameter or inside diameter. If your belt has snapped, measure the overall length of the belt and that calculation will be the same as your outside circumference measurement. You should also measure the Top Width of your existing belt and match that size to the belt you see online. The 2 most popular belt top width sizes are (1/2″) and (5/8″, also known as 21/32). If you are unsure how to determine your belt size, the answer you need is on the web. Go to any popular search engine and search ” How to measure a V belt video”. For machines that take more than one belt, Its highly recommended that you follow both of the steps listed above. Double check OEM part number and Measure the outside circumference of your belt. Lawn and garden equipment endure a rigorous task and these lawn and garden. The factory OEM belt that fit your machine the day it came off the production line, may not be exactly the same fit years later after hundreds of hours of use. That is why many OEM’s incorporate adjustment mechanisms on the pulley system. The adjustments are installed specifically for belt replacements down the road. Pulley adjustments range from idler pulleys where you can adjust the hex nuts to specific brackets that are adjustable. You can read about your specific pulley adjustment type in your users manual. We would be more than happy to correct any issue. Regardless if we accidentally sent you the wrong item (which seldom happens) or the customer ordered the wrong part by mistake. WE WILL correct any potential problem. Liability: UPE_Group is a distributor and as such, has no direct or indirect control over the materials, processes, or quality control procedures used by the manufacturers of the products we resell. Accordingly, UPE_Group will NOT be held responsible for damages resulting from product defects, or, from mis- applications/improper installations by the customer or end user. It is the purchasers responsibility to determine the suitability of the product for the specific application. If it is deemed defective, UPE_Group shall be held harmless of any and all damages including (but not limited to) physical injury, property damage, water damage or otherwise for any reason. It is the purchasers responsibility to determine the suitability of these products for your specific application. Including, but not limited to, using alternative products. UPE_Group shall be held harmless of any and all damages including but not limited to physical, property, water or otherwise for any reason. Your use of any information or materials on this listing is entirely at your own risk, for which we shall not be liable. By submitting your order, the purchaser acknowledges agreement with the Terms & Conditions as outlined here and our website. The item “REPLACEMENT BELT FOR John Deere mower GX20072, GY20570 1/2×103″ is in sale since Tuesday, December 11, 2012. This item is in the category “Home & Garden\Yard, Garden & Outdoor Living\Lawn Mowers\Lawn Mower Parts & Accessories”. The seller is “upe_group” and is located in Kennesaw, Georgia. This item can be shipped to United States. 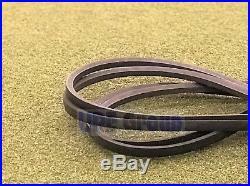 REPLACEMENT BELT FOR John Deere GX20072, GY20570 (1/2×103). This a High Quality aftermarket replacement belt. To ensure you are ordering the correct belt for your machine. Please reference your OEM part number when selecting the belt for your machine. For riding mowers, the OEM sticker can usually be found under the hood or seat. Its always highly recommended to order based off of your OEM part number. If you do not have access to your OEM part number, please measure the outside circumference of your existing belt to make sure the dimensions match the belt you are ordering. ALL Lawn and garden belts are determined by their Outside circumference ONLY. Lawn and Garden belts are NOT determined by their diameter or inside diameter. If your belt has snapped, measure the overall length of the belt and that calculation will be the same as your outside circumference measurement. You should also measure the Top Width of your existing belt and match that size to the belt you see online. The 2 most popular belt top width sizes are (1/2″) and (5/8″, also known as 21/32). If you are unsure how to determine your belt size, the answer you need is on the web. Go to any popular search engine and search ” How to measure a V belt video”. For machines that take more than one belt, Its highly recommended that you follow both of the steps listed above. Double check OEM part number and Measure the outside circumference of your belt. Lawn and garden equipment endure a rigorous task and these lawn and garden. The factory OEM belt that fit your machine the day it came off the production line, may not be exactly the same fit years later after hundreds of hours of use. That is why many OEM’s incorporate adjustment mechanisms on the pulley system. The adjustments are installed specifically for belt replacements down the road. Pulley adjustments range from idler pulleys where you can adjust the hex nuts to specific brackets that are adjustable. You can read about your specific pulley adjustment type in your users manual. We would be more than happy to correct any issue. Regardless if we accidentally sent you the wrong item (which seldom happens) or the customer ordered the wrong part by mistake. WE WILL correct any potential problem. Liability: UPE_Group is a distributor and as such, has no direct or indirect control over the materials, processes, or quality control procedures used by the manufacturers of the products we resell. Accordingly, UPE_Group will NOT be held responsible for damages resulting from product defects, or, from mis- applications/improper installations by the customer or end user. It is the purchasers responsibility to determine the suitability of the product for the specific application. If it is deemed defective, UPE_Group shall be held harmless of any and all damages including (but not limited to) physical injury, property damage, water damage or otherwise for any reason. It is the purchasers responsibility to determine the suitability of these products for your specific application. Including, but not limited to, using alternative products. UPE_Group shall be held harmless of any and all damages including but not limited to physical, property, water or otherwise for any reason. Your use of any information or materials on this listing is entirely at your own risk, for which we shall not be liable. By submitting your order, the purchaser acknowledges agreement with the Terms & Conditions as outlined here and our website. The item “REPLACEMENT BELT FOR John Deere GX20072, GY20570 (1/2×103)” is in sale since Thursday, April 3, 2014. This item is in the category “Home & Garden\Yard, Garden & Outdoor Living\Lawn Mowers\Lawn Mower Parts & Accessories”. The seller is “upe_group” and is located in Kennesaw, Georgia. This item can be shipped to United States.